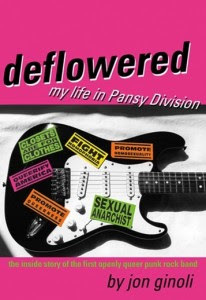 The queereads chosen tome of April is "Deflowered: My Life in Pansy Division" by the band's founding member, Jon Ginoli. Pansy Division was the first out and proud queercore punk rock band to hit the semi-big time. The memoir follows the journey from their inception in San Francisco, to their search for a music label and a permanent drummer, to their current status as indie rock icons. They toured with Green Day and faced homophobic fans during their search for acceptance in the music world. This memoir is an impassioned account of staying true to the artistic vision of queer rock'n'roll. On May 1st Jon Ginoli will be in the store to sign books and talk music and answer any questions you might have from "Deflowered"! 4. Come back to Sam Weller's on May 1st to meet the author and have him sign your book! It's that easy! Everyone is invited! Do you like punk rock music? Do you often enjoy reading? Well this is the perfect month to join queereads! See you there! About a week ago I went to see Coraline in 3D. It blew my mind, I found myself whispering "wow" with a child-like wonder. The story was fantastic, and the animation-stop motion-was nothing short of spectacular, especially in 3D. I had wanted to read the book for some time and bought one with the cover shown here that is numbered and signed by Gaiman and McKean. The only problem was that it was so nice that I didn't want to read it. A couple of days ago I picked up a cheap little paperback to have as a reading copy, so my nice one could just sit on the shelf and look pretty. 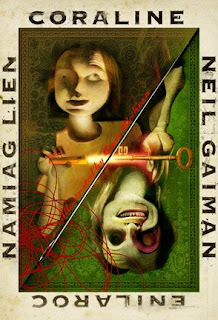 Gaiman is a great story teller. He so simply gets to the extraordinary that it seems believable, and that that world could exist somewhere. I found a lot of truth in Coraline's story. A girl who simply wants to be noticed by her parents who are too busy working to spend time with her, so she discovers a world where her "other" parents seem to be a dream. They cook her food that she likes, and they play with her, and everything seems the way she's always wanted it, the only weird part is that they have buttons for eyes. Everything seems great until things begin to go wrong and become scary and Coraline realizes how much she wants her real parents back and that she just wants to go home. I don't want to leave out Dave McKean's fabulous illustrations, they add that little bit of extra creepiness to Gaiman's already creepy story. This will be one of those rare times when the book and the movie are both great, so I encourage you to see the movie (try to see it in 3D, I promise you won't regret it!) AND read the book. I'm nearly through half of the book and I'm finding it a really quick read, and even though I know what will happen because I saw the movie, I can't wait to read those parts of the book to find out what's different. On Monday mornings I work the Main Floor Information Desk. One of the opening info desk tasks is to pull internet orders that came in the previous night. I was dutifully retrieving book after book until I hit an order for The One That Cannot Be Found. The title of The One That Cannot Be Found (TOTCBF) changes from time to time. But it seems that every other week or so, I simply cannot find a book on our shelves no matter hard I try. If you've been in our store, you know there's a lot of footage to search for a missing book. If you haven't, this is a glimpse of the Main Floor. In dogged pursuit of TOTCBF, I began to pull every spiral bound book from a row of cases, since the one I was looking for had a spiral binding. I encountered some titles on Utah law, Financing Government in Utah, and a copy of Minuteman for a Day. All interesting in their own way, but not TOTCBF. The next spiral I pulled off the shelf made me gasp. No, it wasn't TOTCBF. It was a 1973 - 1974 year book from Webster Elementary School. That school, located here in Salt Lake City was torn down sometime in the 1990's and replaced by Bennion Elementary. Many years before it was torn down, I went there. In fact, I attended fourth grade at Webster from 1973 - 1974. All of a sudden, I felt the magic customers sometimes discover in our store. They come to the Info Desks, faces glowing and show us treasures they've found in our stacks. "I had this book when I was a little boy and I've never seen a copy since!" "My mother read me stories from this book!" "I borrowed this book from a library in 1965 and lost it." "My boyfriend read passages to me from this book." You get the idea. We get the stories and it's always a treat to share those moments. Well, I was gaga the same way. I tore through the pages looking for my class. When I found the photos for Mrs. Folias's room, I was simultaneously relieved and disappointed to see that my picture wasn't in there. I had missed picture day. But I saw a picture of my very first boyfriend, Steve O'Reilly who became a Massacre Guy when he grew up, then a Descendent, and changed his name to Stefan or something. There was a photo of my second boyfriend, or his twin, I can't remember which one I "went with" in fourth grade. They were all there: my best friend Catherine J., the boy who threw up on the first day of 7th grade and was forever known as "the boy who threw up," the girl who was picked on, the tough boy that stomped on my foot and made me cry, and my teacher, the indominatable Mrs. Folias who now helps teach my daughter at a different school. 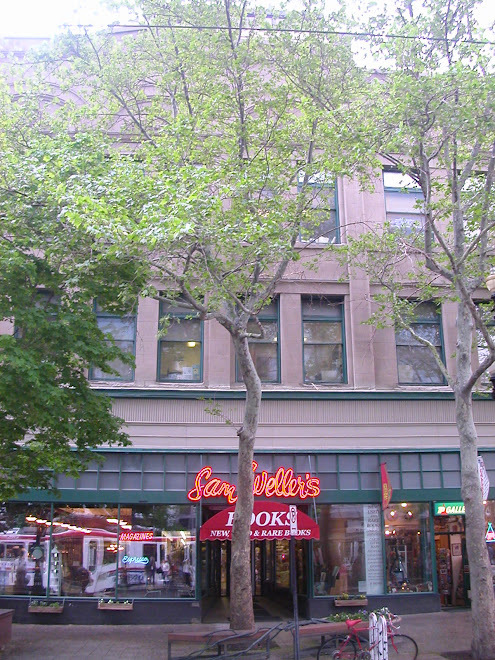 I made my way through the book store, pointing pictures out to my coworkers, sharing stories and laughing at the clothes people wore then. It was great. I'm sure my face was glowing. Of course I bought the book. And that TOTCBF? I admitted failure and passed the record on to the A-team, those who search harder, better and faster for missing items. I hate doing that. But they usually find the books. 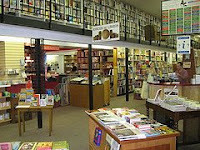 And I felt good anyway because I'd found a little piece of my past right here on the shelves of my very own bookstore.